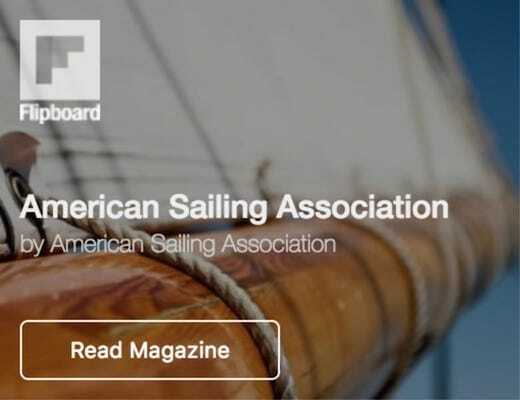 The ASA Veterans Sailing Education Program is in its third month of operation and several stories about the program have arrived at ASA from veterans and ASA Affiliates. US Navy man Galen Gambino and his Army veteran father, Robert Gambino, both of Atlanta, GA, flew into Miami International, rented a car and drove down to Veteran Sailing Association, an ASA Affiliate in Tavernier, FL, to spend the week between Christmas and New Year’s with the owner, former Navy SEAL and ASA Certified Instructor, Captain Joseph “CJ” Mastrangelo. “CJ” offers a bundle ASA 101, 103, 104 class free of charge to active duty and honorably discharged veteran military personnel, provided that they study and pass both written and open-water sailing tests. This is the story of how Galen and his father Robert spent the final week of 2018. 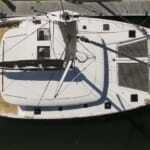 Neither had ever before set foot upon a sailing vessel. 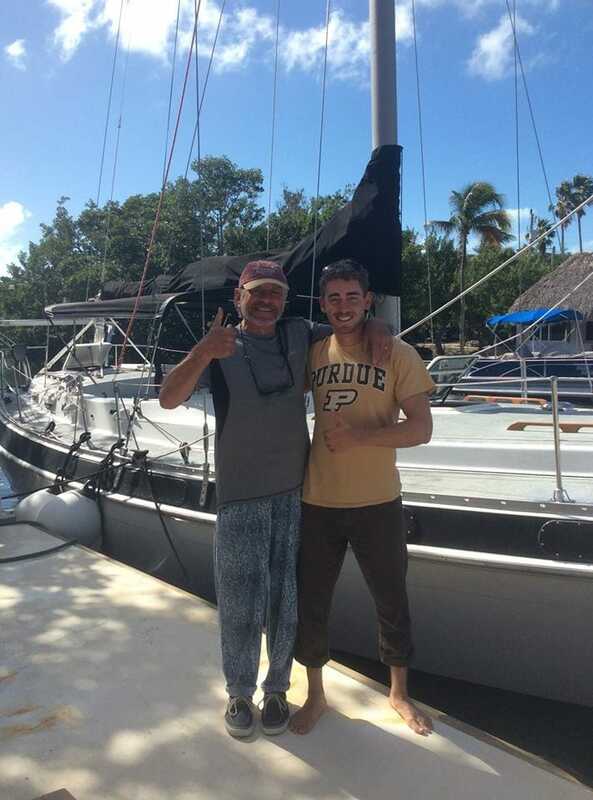 After breakfast at the Holiday Inn in Key Largo, FL, Galen and Robert arrived at the Veteran Sailing Association, one of ASA’s newest Affiliates in the Florida Keys. Their first introduction to “CJ” was to read the black letters on the tailgate of his pickup truck: “I AM NOT IN YOUR HURRY”. Galen and Robert trailed “CJ” to his ASA office that doubles as a dive shop and seated themselves upon folding chairs for a whiteboard lecture. 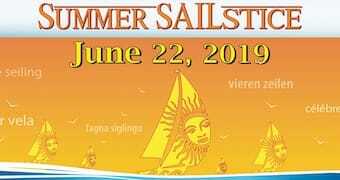 For months, Galen and Robert have been reading the three ASA textbooks: Basic Keelboat Sailing Made Easy, Basic Coastal Cruising Made Easy, and Bareboat Cruising Made Easy, so a lot of things in “CJ’s” lecture sounded familiar. Their anxiety mitigated somewhat. After the lecture, “CJ” introduced Galen and Robert to his two “girls”: an O’Day 222 and a Morgan Out Island 414. While removing the mainsail cover and sail ties of the O’Day 222 Dutch Treat, a manatee glided by their starboard side, and life seemed good. Down the canal and into the ocean, Galen and Robert tried to learn how to “feel” the wind. 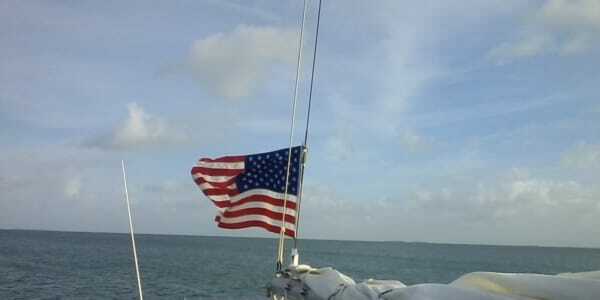 The wind picked up to 12 knots with gusts to 20. Whitecaps appeared everywhere. 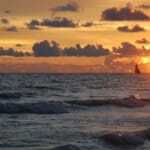 Galen and Robert wondered why they were the only boat on the Gulf of Mexico! Heeling and moving, rocking and rolling, this was “baptism by fire!”. They were glad to be wearing PFDs! For three days, “CJ’s” drills persisted: Come About! Bear Off! Jibe! Head Up! COB! Figure 8! Heave-to! Feel the wind! Where is it? This was ASA 101, 103 on the water. After completion of their sailing drills, Galen and Robert sat for two written examinations of 100 questions each. Both of them passed! Their anxiety waned and their confidence buoyed. And then to Day 4 and ASA 104 aboard “CJ’s” 1976 Morgan Out Island 414 Anjin Sin, Japanese for “Honorable Pilot”. As for many sailing students, it was this experience in ASA 104 that Galen and Robert came to understand the seductive pleasure of how peaceful it can be offshore. 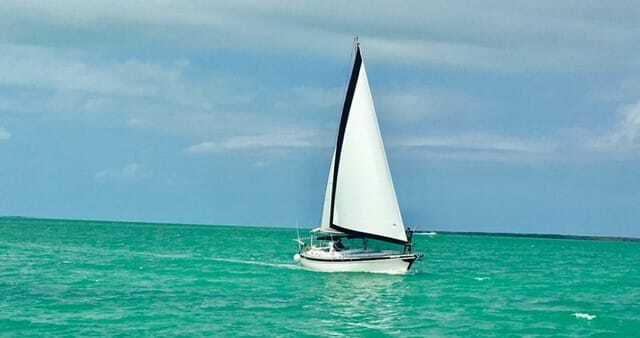 Sailing west through the Keys at 6 knots, among mangroves and smiling dolphins, Galen and Robert realized they too were smiling just as broadly. In the late afternoon, Anjin Sin was at anchor on the leeward side of Cotton Key. “CJ” jumped overboard to check the set of the anchor. Not to be denied, Galen and Robert also plunged into the refreshing salt water. It was “other-worldly”, no traffic backups, no honking horns, no searching for a parking space. For Galen, it also meant a very welcome respite from his duty with the US Navy Bomb Disposal Unit. His father, Robert, by the way, is a Vietnam Army Veteran. Stories of past experiences and future plans are discussed. Sunset comes. Red, yellow, orange, indigo, purple, and finally velvet black. The late December stars appear like brilliant small gems: Orion’s Belt, the Seven Sisters, the Evening Star, Venus. Below deck, “CJ” was busy in the galley, and then dinner magically appeared as they floated quietly, just offshore. Then dawn came. On this last day of their ASA 104 cruise, Galen and Robert enjoyed spectacular sailing. Upon returning to homeport, there was one more written examination. Galen passed, Robert did not, but that’s fine. Both can go cruising together. Alert the Coast Guard! Robert had his credit card ready to pay for ASA 104 because he did not pass. That was the deal, he thought. But no, “CJ” does not charge veterans, pass or fail, for ASA 101, 103, 104. Back on land in Atlanta, Robert notices flags in the breeze more than he once did. Now, Robert is no longer in his car just driving down the street. He’s on a close reach! A ninety-degree turn to port, formerly known as a left turn at an intersection, is now coming about! It’s a sailor thing. 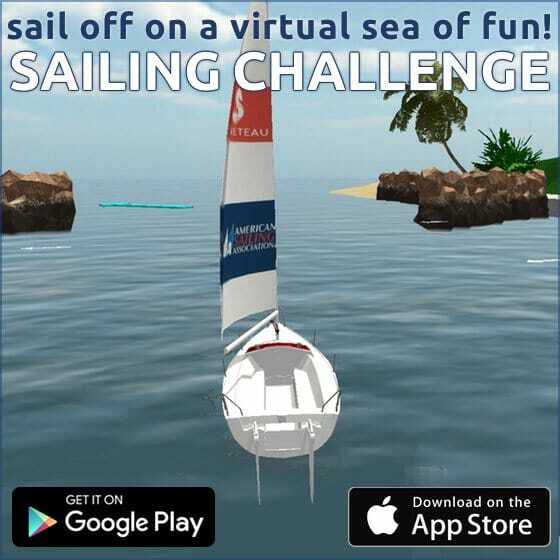 Memories wane over time, but for people who learn to sail at an ASA Affiliate, the experience does not diminish completely, especially the ASA 104 certification cruise which is the first time in the ASA curriculum that a new sailor stays aboard a boat overnight in a location different from where s/he departed. Those memories tend to endure. This cruise, for these two military men, was no exception. And they shared that experience together. 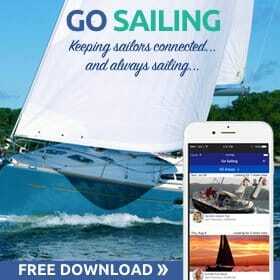 You can find Captain Joe Mastrangelo at Veteran Sailing Association in Tavernier, Florida. Take a look at them on Facebook or on the ASA website. My wife and I went through Captain Joe’s Veteran Sailing Association school in summer of 2018. It was amazing experience, challenging, but amazing. If you are a veteran and are on the fence about getting certified I highly encourage it. 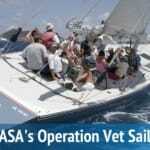 Even if you are not a veteran, the cost of attending VSA sailing school for ASA 101, 103, and 104 certifications is cheaper than most other sailing schools out there.